- Essential character development for and exposition about Aeryn and Pilot along with some important continuity with regards to Pilot beginning a natural bonding process with Moya and why Moya was equipped with a contraception device in season 1. Velorek will also become significant again in season 4. - When Pilot is bonded to Moya, he sees images which are implied to be Moya's memories, but they are images of things which have not happened yet. - Pilot's ancient language is too complex for the translator microbes to properly translate, so in order to communicate with other species, Pilot must simplify his language. - Pilot was not Moya's first pilot but instead was bonded artificially to her, a process that left Pilot in a great deal of permanent pain, up until this episode when the artificial bonding was severed. Pilot having to bond with Moya naturally will result in reduced control for up to one to two cycles. - Velorek installed the Peacekeeper contraception shield to prevent Moya from reproducing so that Crais' project would never come to fruition. - The flashback to Aeryn participating in the execution of Moya's original Pilot under Crais' orders. - Aeryn revealing that she and Velorek were lovers. - Pilot discovering the tape and assaulting Aeryn. - The flashback to Pilot being installed into Moya. - Velorek to Aeryn: "You can be so much more." - The revelation that the artificial process which bonded Pilot to Moya left him in a permanent state of a great deal of pain. - The flashback to Moya waking up to a different pilot. - Pilot severing his connection to Moya, ending the pain. - John and D'Argo playing rock paper scissors to determine which one of them will try to talk sense into Aeryn. - The flashback to Aeryn betraying Velorek. - John and Aeryn doing battle with Pilot's DRDs. - Pilot revealing that he was rejected by the elders to serve as a leviathan pilot, leading him to have no choice but to participate in Velorek's shady business if he was to ever be bonded to a leviathan at all. The Way We Weren't is a magnificently dark story which drudges up all sorts of uncomfortable memories for Aeryn and Pilot and fleshes all of it out quite well. What makes it such a strong story isn't simply that Aeryn participated in the execution of Moya's original pilot, but that Aeryn demonstrated at least some level of willful complicity in her actions aboard Moya when she chose to actively work against Velorek to service her own interests. The tragedy of the story is that Aeryn's interests were not with her cover story of preferring Prowler duty, but instead with running away from her feelings of true love for Velorek. In effect, Aeryn's inability to deal with her feelings of love for Velorek led to not only his (probable) execution, but also cost Moya and Pilot their freedom, assuming Velorek's plan to stop Crais' black project could have been carried out successfully without Aeryn's interference. In addition, other nice tidbits of texture are strung about as well. Aeryn rightfully sees hypocrisy in Zhaan's, D'Argo's, and Rygel's outrage at Aeryn murdering Moya's old pilot under Peacekeeper orders while they were willing to cut off one of Pilot's arms (even if they do grow back...) of their own free will out of selfish desire to go home. Likewise, Pilot is shown to not be entirely innocent either when he reveals that he knew that fulfilling his desire to be amongst the stars would cost one of his own kind its life. This brings up the episode's only true weakness of course, which is at times Pilot's turbulent emotions cross the line into being significantly less rational than might be realistic. As Velorek said, Moya's original pilot's fate was already sealed, so Pilot's guilt is irrational. 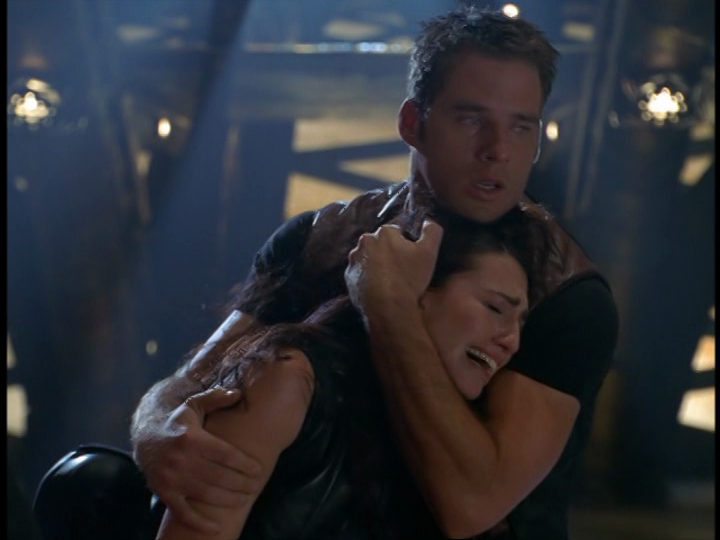 Likewise, Pilot's outrage at Aeryn is also irrational, though perhaps less so. However, as a consequence, Pilot's behavior and rage throughout the story seems grossly out of character. It's worth noting that Pilot having lived in a constant state of pain for the last few cycles might easily substantiate his explosive breakdown in this episode, but the story may have been better if this were stated explicitly. Instead, we can't really know whether or not Pilot would have acted that way pain or no pain, which at best is an omission in the writing and at worst disservices Pilot's character. 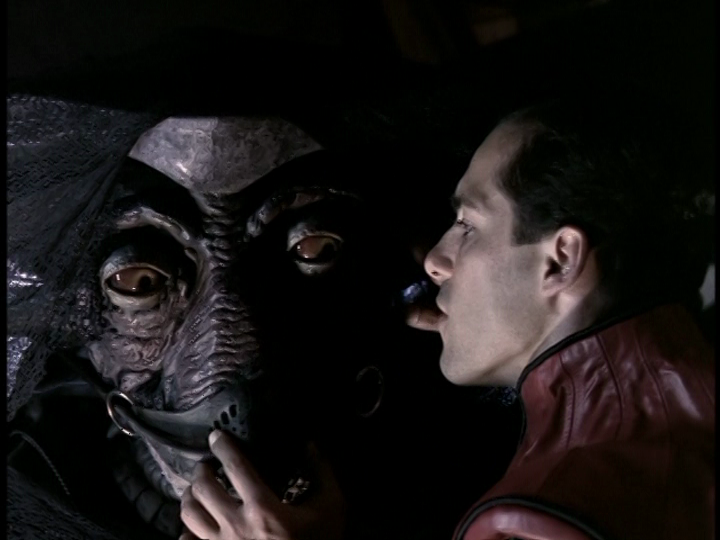 Overall though, the broad takeaway from this story is that it's an outstanding piece of drama and character development and among the best episodes of Farscape so far. "The tragedy of the story is that Aeryn's interests were not with her cover story of preferring Prowler duty, but instead with running away from her feelings of true love for Velorek.... but also cost Moya and Pilot..."
Wow. Mind blown. Of course that was the result, much the way Chiana and Rygel's greed in A Bug's Life kicked off Scorpius' involvement in Crichton's life. Glad I found your site.